This unique treatment integrates Ayurvedic facial marma massage with the use of a bronze Kansa Wand and nourishing oils. This treatment was developed to address current day concerns to look youthful and healthy without invasive interventions. Regular face massage can lift and tone facial muscles, soften features and promote radiance. Kneading facial muscles brings nutrients to the treated area, helping the collagen and elastin fibres retain their elasticity, while stimulating marma points can balance energy and and release blockages. This amazing face massage can be used on its own or can be integrated into a full body massage routine or combined with any other treatment. 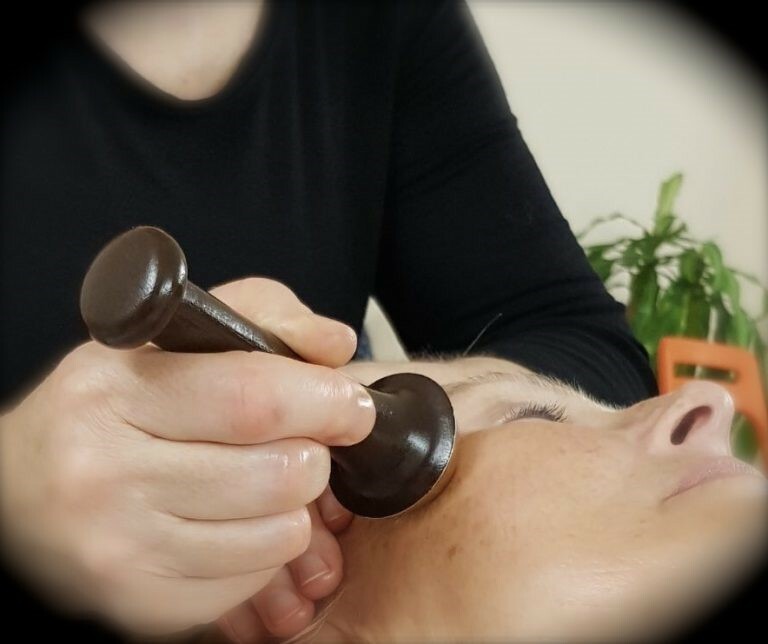 You will also learn how to massage your own face with the Kansa Wand. The course is suitable for qualified therapists, eg those qualified in one or more of the following skills: Aromatherapy, Massage, Reflexology, Indian Head Massage, Beauty Therapy etc. Course tutor Lesley Hart teaches this course on behalf of the London Centre of Indian Champissage International(LCICI) and attendees will receive a LCICI certificate of competence. To attain a diploma, students are required to do three case studies of four treatments each (12 treatments total) and do a practical and written exam,. This is recommended to all students. Qualified holistic & beauty therapists may be eligible to obtain insurance to practice professionally with the LCICI Attendance Certificate obtained following the course – please check with your own insurance company who can clarify this for you. Registration This course is accredited by CMA and is worth 14 CPD points. Contact us for details of training near you.